Denver native Mathew Vitale will happily tell you nothing is more important than the time he spends with his family, though the way you feel when stepping out of his chair comes in a close second. 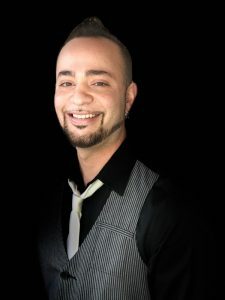 With seven years of professional experience, Mathew is advanced in not only color and cutting techniques, but also delivers a superb blow-dry and is an expert with brazillian blowouts / keritin treatments. For all of those men who deserve to be pampered as well, he is expertly trained in barber techniques and straight razor shaves. Mathew strives to give each individual who sits down in his chair the absolute best, whether that design be classic or cutting edge, or red, blue, black or blonde. He achieves his goal through continual education, attention to detail, and an excellent creative eye. Mathew loves creating beauty and does his part to help keep the world a beautiful place. Book an Appointment with Mathew.